If you have long hair, you’re more prone to developing a clogged shower drain than if you have short hair. Instead of yelling curses at your luscious locks, just install a simple screen over the shower drain. For a few dollars, you can prevent a potential plumbing catastrophe. Just remember to empty the contents of the drain screen into the trash after each shower. It’s a little gross, but well worth the ability to keep your shower draining like normal. You don’t want to skip giving your dog a bath, but all that fur down the drain could cause serious plumbing trouble. When the weather is warm enough, an outdoor pet shower is the perfect solution. If you don’t have a few hundred dollars to spend installing one, a kiddie pool is a great option, too. When the weather turns cold and you have no choice but to bathe your pup indoors, simply lay a washcloth over the drain before you pull the plug. This makes the water take longer to drain, but it traps all the fur so you can dump it in the trash and prevent a clogged shower drain. There’s this high-tech gadget that people use to get tangles out of their hair. It’s called a hair brush and it’s taking the world by storm! All jokes aside, brushing your hair immediately before hopping in the shower can do wonders for reducing drain clogs. You’ll still lose some hair in the shower, but by brushing first, you end up putting a lot more hair in the trash than down the drain. 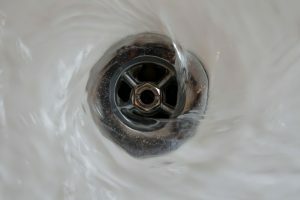 Hair isn’t the only thing that causes a clogged shower drain. Bits of soap are the other major culprits. To help prevent solid pieces from ending up down the drain, install a shower caddy to hold your soap. Choose a caddy that suits your needs so you can store shampoo, razors, shaving cream and all your shower essentials in one place. NextWhere Is the Hot Water Heater Pressure Relief Valve?